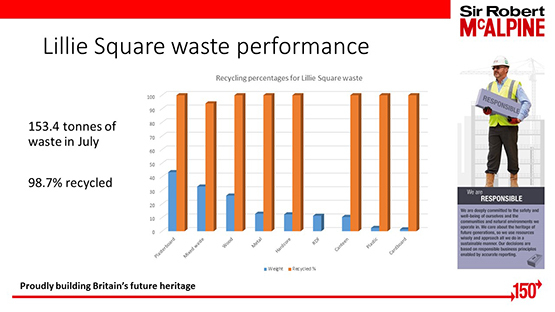 As the Lillie Square project was evolving from superstructure and cladding towards utilising fit-out trades, the project held a ‘managing fit-out waste workshop’ with subcontractors. The purpose of the session was to help raise awareness about the importance of waste on the project and to also discuss ways in which waste could be reduced. Appointing a package waste champion to provide consistent leadership and encouragement in reducing waste. Utilising a system such as a timber pallet ‘take-back scheme’ to prevent the disposal of re-usable pallets. Re-using packaging and protection materials. Delivering training and toolbox talks to all project staff to raise awareness about how to reduce waste. Using corner protection rather than full protection for items, in order to minimise packaging waste. Avoiding temporary solutions on site. Transferring left-over materials onto other projects to promote material re-use. The workshop encouraged the project team to work collaboratively to understand more about the waste produced on site and resulted in positive actions to reduce waste going forwards.